Associate Professor Richard Whiteley is a visual artist who is conducting research into ancient Roman cameo glass. His observations build on a little-known theory relating to the manufacture of these highly sophisticated works of Roman craft that appear to have been produced for a short period before the invention of glass blowing techniques in the first century BCE. Whiteley has built a unique multidisciplinary project that is driven by practice-led research at the Australian National University (ANU). Researchers representing visual art, physics-engineering and classics have established a research position that strongly indicates ancient Roman cameo glass was manufactured by an unknown process that has not been used for over 2000 years. For centuries, it has been assumed that the Romans used a lengthy glass blowing and carving process to create cameo works. Investigations by Whiteley suggest that this assumption is incorrect, and that the works were produced by a pressing pate de verre (paste glass) process that still needs to be fully defined. Whiteley will speak about his research and how his visual art practice lead to this significant discovery. 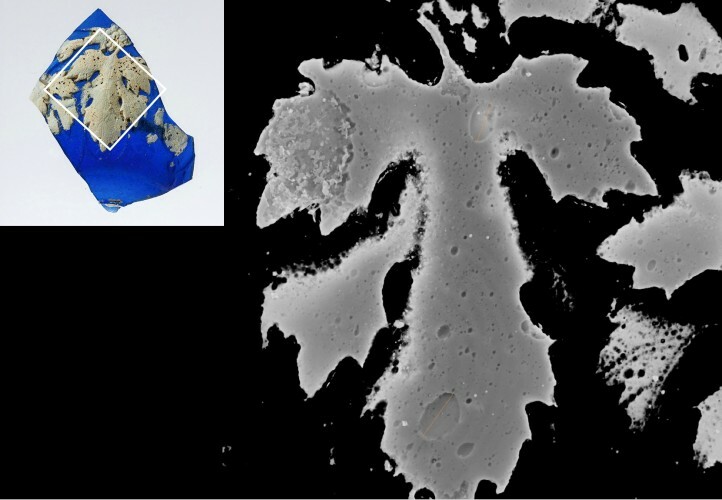 Image: Inset: Fragment of Roman Cameo Glass, c. 30-1 BCE, Australian National University Collection; Right: Rear view of the white cameo glass layer showing attachment to blue glass. Source: virtual dataset acquired via a 3D Micro-CT tool and rendered in Drishti software. Courtesy ANU, Canberra.